Mites are among the oldest living beings on the Earth's surface; they may live and grow in different environments such as plants, flowers, animals, fresh and salt water, Earth, But even organic waste, mattresses, books, etc.. Mites are tiny Arachnids, belonging to different species; those that are specifically related to asthma are called "dust mites" because they have their permanent habitat in the home. 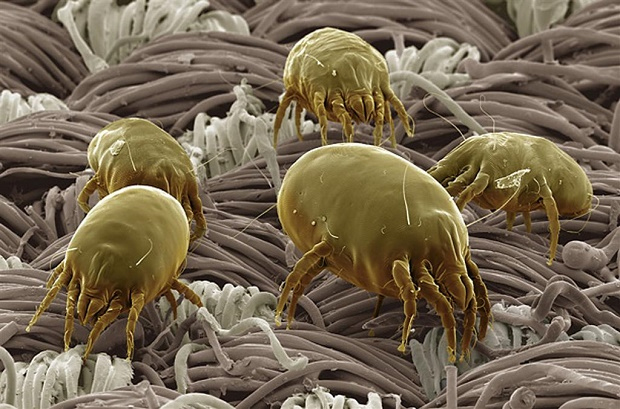 The ideal environment for the growth and proliferation of dust mites are the places warm and moist. At home we find them particularly within upholstery cushions, mattresses and duvets, but are also found in carpets and carpeting. There are no reference values related to indoor air (other than those inherent in some work environments). Mites can cause allergic diseases such as rhinitis, conjunctivitis and bronchial asthma, Eczema and cough. Frequent washing of bedding. Reduce the humidity in confined environments and ventilarli properly. Limit the use of the sources of dust build, as upholstery, Plush, etc.. and still be frequent.